Ottawa Senators goalie Craig Anderson didn't mince words on this topic. NHL goalies don’t tend to like the shootout in general, but they really can’t stand the game-deciding event when they come up on the losing end. 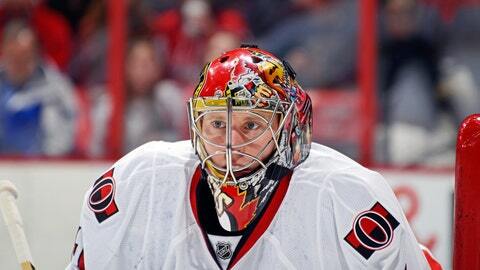 Ottawa Senators netminder Craig Anderson was the loser Thursday night against Ben Bishop and the Tampa Bay Lightning. The loss put Anderson on tilt a little bit after the game, especially when he started to comment on the shootout itself. "It’s a skills competition," Anderson said, according to SenatorsExtra.com via ProHockeyTalk.com. "Flip a coin and call heads. That might be a better way to settle it." Anderson isn’t exactly a master of the shootout, which might mold his opinion some. He’s just 20-26 over his career in shootouts with a .622 save percentage. Anderson certainly has Bruins goalie Tuukka Rask’s support when on the anti-shootout front. Rask has been outspoken about the shootout over the last two years especially, and he went off against the event earlier this season following a shootout loss to the St. Louis Blues. "I’d gas it right away," Rask said after that Nov. 21 loss. "Midseason, take it away. I don’t [expletive] want it."